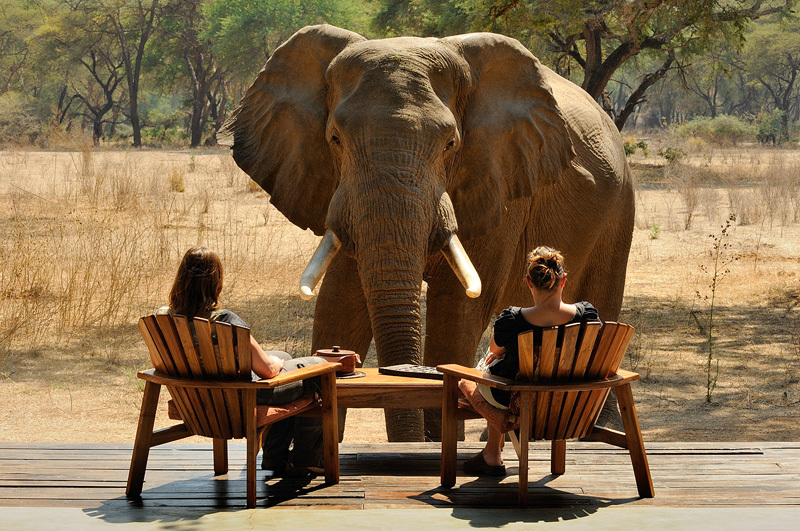 This was shot in our bush camp in Lower Zambezi NP, Zambia. During the dry season elephants are constantly moving through camp. They are not only interested in the water, but also in the nutritious pods that fall down from the trees - they just love them. One afternoon my wife Daniella and the lodge manager were watching an elephant feeding from a tree in the distance. It moved from tree to tree and slowly got closer to the camp. Then it just walked to the verandah where they were sitting, and briefly stopped to check them both out. They sat there motionless without making a sound to not to disturb the animal in any way, and after a few seconds it moved away again. Breathtaking is an understatement.